No, productivity is not widely weak. Companies are dynamic. Japan: Stop misreading the data. Start seeing opportunity. Despite the most recent inflation report, headlines hide the real story. Price increases aren’t widespread or mostly from monetary-causes. 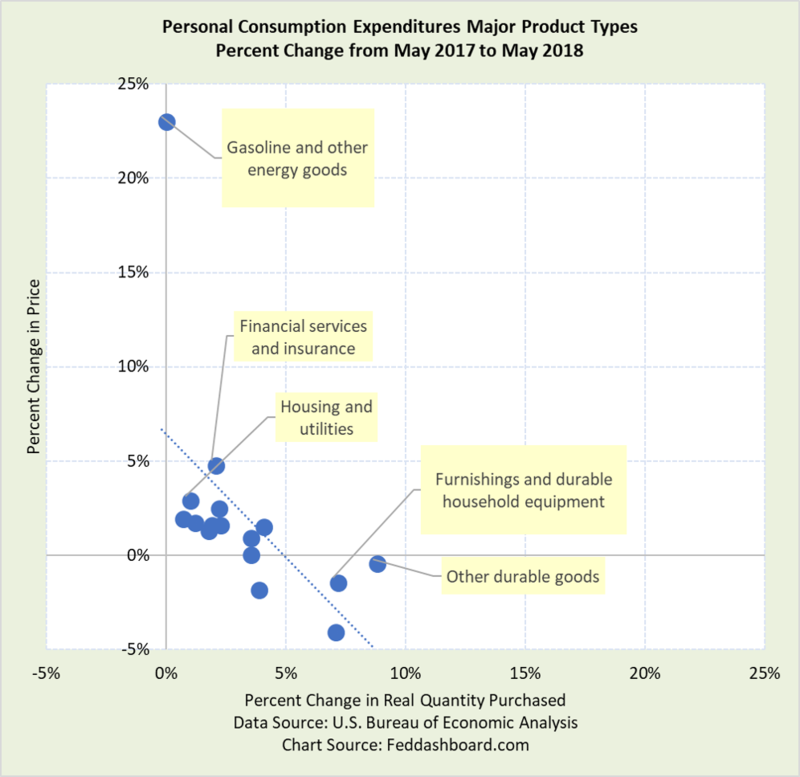 In May, the Personal Consumption Expenditures (PCE) deflator finally popped above the 2% target of the Federal Open Market Committee (FOMC) — both the annualized increase from April and compared to May 2017. Popularly called “inflation,” it conjures images that prices generally rose 2% or that the increase was due to monetary causes (primarily Federal Funds rate and Fed’s balance sheet) controlled by the FOMC. Is that true? Not really. The PCE deflator is a weighted average of product price changes. The U.S. Bureau of Economic Analysis (BEA) publishes over 300 deflators from high-level aggregates to more specific product types. The U.S. Bureau of Labor Statistics publishes hundreds more. Just at a high-level, Gasoline and other energy goods grew almost five times as fast as the next category, Financial services and insurance. In “Inflation, a villain found, and a circular game,” the surprising story of Financial services and insurance was uncovered. Clearly, prices vary widely. But, deflators are weighted by purchases. Housing and utilities purchases are 7.2 times the size of Gasoline and other energy goods and 18.1% of all PCE. 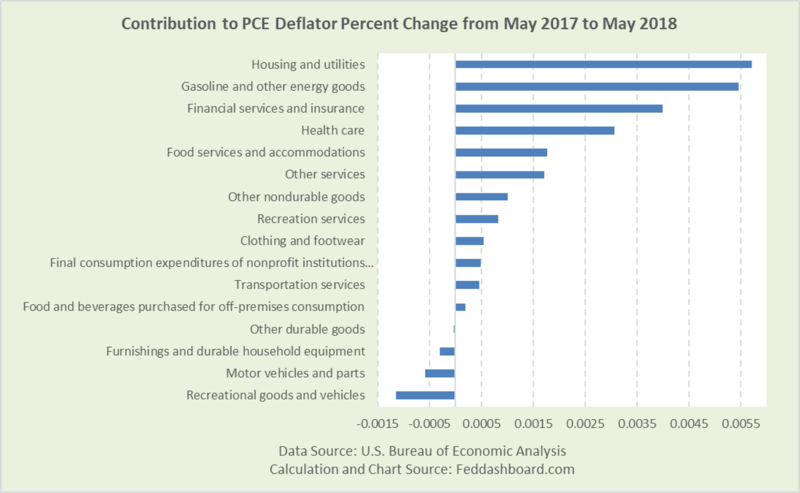 So, Housing and utilities made the top contribution to the PCE deflator in May. The point of the 2% target as a policy guide is that the price change is assumed to be due to monetary causes and controllable by the FOMC. Housing has a direct link in the FOMC’s purchases of Agency Mortgage-backed Securities. Housing loans are influenced by the FOMC to the extent they are linked to the Federal Funds rate. But, if the loan funds come from global sources, then it is less. Shoppers have been buying more durables as prices fall since 1995 – thanks to the global tech and trade transformation. The striking pivot is shown in “Concentrated price changes mean less control for the Fed” plus product-level pictures in the Money & Prices Section. 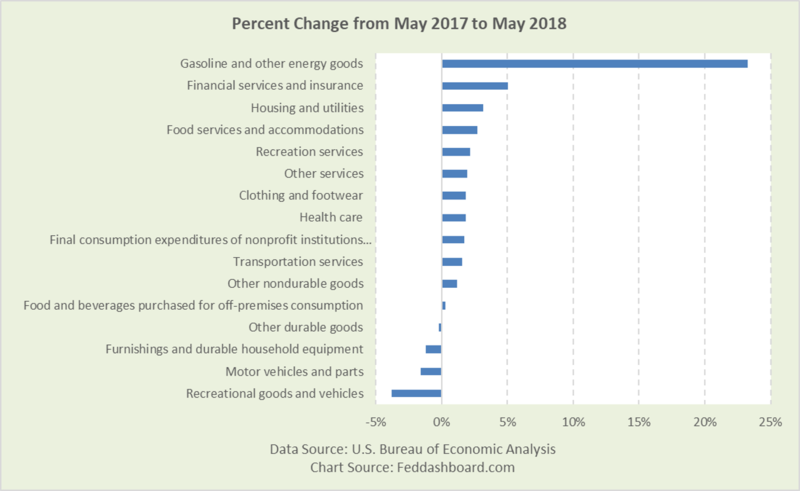 This downward slope holds for both individual products and across product types over time as shown in “Lower prices are good – what central bankers need to learn from shoppers.” Below is the “across” pattern in the past twelve months of data. Other durable goods are mostly jewelry, educational books, and medical equipment. These luxuries and necessities aren’t as price-sensitive. Higher prices tend to cut purchases – directly hurting Real (price-level-adjusted) Gross Domestic Product (GDP). This insight is hidden when Nominal GDP is targeted. To learn more about how to apply these insights to your professional portfolio, business or policy initiative, contact “editor” at this URL. Previous ArticleNo, productivity is not widely weak. Companies are dynamic.